New on NOBLE – the Winter 2018 issue of Dialogue Magazine, produced by Blind Skills, Inc. Dialogue Magazine is a news magazine edited by and for individuals who are experiencing vision loss or are blind and their friends and families. DIALOGUE publishes articles, personal essays, interviews, news and resources on all aspects of coping with a vision impairment. New on NOBLE, the July/August 2018 issue of Wildlife in North Carolina, the magazine from the North Carolina Wildlife Resources Commission about the state’s fishing and hunting resources and education. All about the outdoors. Read the July/August 2018 issue of Wildlife in North Carolina today!!! Once you’ve finished this, check out all of the other locally recorded magazines we have to offer on NOBLE and make them part of your winter reading. Lots more to download and listen to on NOBLE. Check out NOBLE for locally recorded Magazines, Books, and even Podcasts – https://statelibrary.ncdcr.gov/lbph/read/download/noble, your source for local downloadable favorites. New on NOBLE, another edition of North Carolina Historical Review for your downloading and listening pleasure. Check out the April 2018 edition of the NC Historical Review and learn more about the great history of the state of North Carolina. Lots more to download and listen to on NOBLE. Check out NOBLE – https://statelibrary.ncdcr.gov/lbph/read/download/noble for more local downloadable favorites. New on NOBLE, the October 2018 and November 2018 editions of the very popular Our State Magazine, the magazine all about North Carolina. Lots more to download and listen to on NOBLE. Check out NOBLE – http://statelibrary.ncdcr.gov/lbph/noble.html for more local downloadable favorites. New on NOBLE, the September 2018 and December 2018 editions of the very popular Carolina Country Magazine, The monthly magazine with insightful stories brought to you by North Carolina’s electric cooperatives. It’s here!!! All the news you can use from your favorite library is in the Tar Heel Talk Winter 2019 edition. This digital only edition features a look behind the curtains of production, Staff Features, New Services and the BARD Madness contest! Read it, download it or listen to it right now on our newly designed and enhanced website!!! 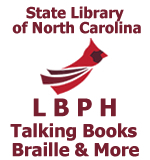 – http://statelibrary.ncdcr.gov/lbph/outreach/tar-heel-talk. Missed an issue of Tar Heel Talk? Check out the Tar Heel Talk Archive to catch up on all the news happening at the library!!! This just posted!!! Tar Heel Talk Winter 2019 braille edition. This edition features the library’s 60th Anniversary celebration, information about upcoming library events, and a book review!!! With March Madness right around the corner, it is time for NCLBPH’s BARD Madness!!! Here are the sixty-four books we have selected for this here’s BARD Madness! Each of these books have appeared at least once in one of BARD’s Top 10 Audio book downloads in 2018. Vote and help us select one book to stand above the others! Be sure to follow us on Facebook and Twitter to see when it’s time to vote and for a chance to win a prize! It’s here!!! All the news you can use from your favorite library is in the Tar Heel Talk Winter 2019 edition. This edition features the library’s 60th Anniversary celebration, information about upcoming library events, and a book review!! !